This is a thoroughly people-focused deck - its apt catchphrase is ‘78 friends you hold in your hand’. Drawn from historical portraits and Baroque and Renaissance paintings and melded into tarot scenes, the people are individual, immediate, and subtly expressive, displaying a range of emotion and instantly recognisable feeling. The Devil is, well, devilishly seductive, inviting you to give in to temptation. The pain and dissatisfaction in the face of the Five of Cups is palpable. The Queen of Swords is perfect, a richly dressed, regal and intelligent woman, but she looks tough and unforgiving, even a little cold. I particularly like the High Priestess, who has an otherworldly look (pale skin, large light eyes, Mona Lisa smile), as though she is the physical bridge between the real and spiritual worlds. There is a such a mix of faces across the deck, all with their individual and appropriate characters - some even look just like people I know in real life. Some cards give an interesting spin on the typical symbolism. The Emperor looks competent, but a bit grim, as though responsibility lies heavily on his shoulders. The Ten of Wands is the opposite: she looks accepting of her burden and is apparently carrying it without difficulty. The woman in the Three of Swords (not a card that normally shows a person) looks shocked and dazed, like she’s just received terrible news but is it yet to sink in. The Page of Swords especially is unusual; he looks bored and uninspired rather than sharp and snappy (perhaps he’s just bored of being inside). Opening the shrink-wrap on the Touchstone Tarot set, there is a solid matte box that opens from the front like a book. Inside lies the companion book, and underneath are the gilt-edged cards. There are 80 cards included in the set: the 78 standard cards, the Happy Squirrel card, and the Touchstone Tarot artist card (not for reading). The 200-page companion book is a community effort, with a dedication by Mary Greer, mini-reviews by Dan Pelletier and Bonnie Cehovet, and sample readings from Bonnie and members of the Aeclectic Tarot Forum, as well as Kat’s own writing. It’s a user manual for the Touchstone, that gets you up and running with the deck. There is a basic tarot FAQ, info on reversals and tarot journaling, a few spreads to try, even sample readings using the deck. 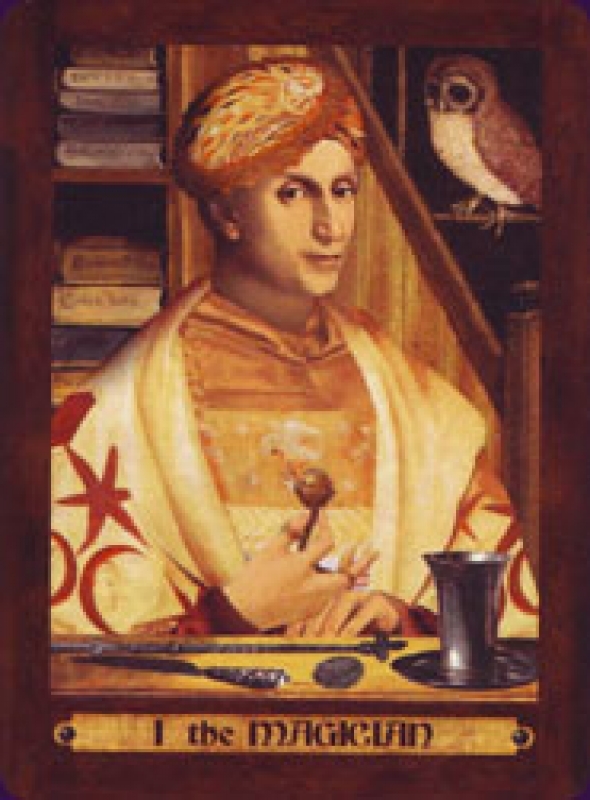 The card descriptions explain the image and symbolism and, in the major arcana, some comments on the paintings chosen and the characters therein. There are also tips on reading multiples of the number or the suit interspersed throughout. And, as with the Golden Tarot, Kat also includes the precise painting sources for her scenes, which is a nice touch. On the whole it’s a useful, comprehensive but not overly wordy companion book. I originally found it difficult to connect with the Touchstone Tarot when I worked with the limited edition, to my dismay. Perhaps it was the smaller size or the darker cards that affected my readings, but I was pleased to find I had no such problems with the larger, lighter Kunati version. On the contrary – I just love this set. Kat and Kunati have put together a really quality package; one that is beautiful, individual, and practical, and filled with people who speak very clearly to me too.